Don't expect former WBC welterweight titleholder Andre Berto to have an easy time of it when he challenges IBF beltholder Jan Zaveck of Germany on Sept. 3. That's an assertion that comes from Berto's promoter Lou DiBella. "Zaveck is very rugged, a very good boxer. Smart. Not a huge puncher, but he's not without power. And I think that's he's got an excellent jab," said DiBella. "So it's no accident that this guy is the world champion. So this is a very, very difficult fight, particularly coming off of a fight that Andre had an off night in." 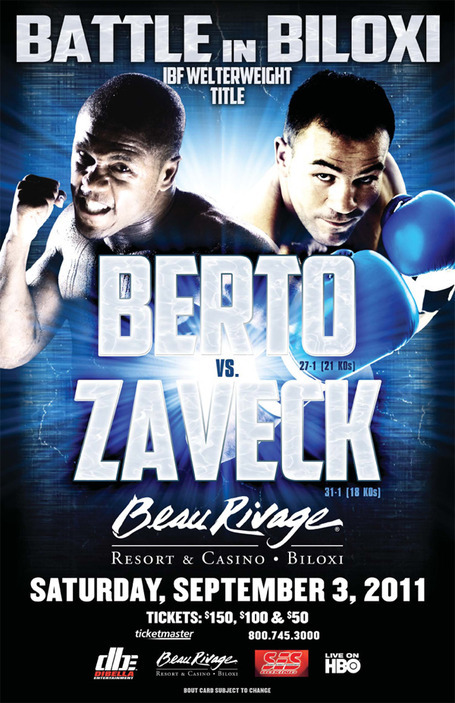 The 27-year-old Berto (27-1, 21 knockouts) will be attempting to rebound from April's unanimous-decision loss to Victor Ortiz when he meets the 35-year-old Zaveck (31-1, 18 KOs) at Beau Rivage Resort and Casino in Biloxi, Miss. Not only has Zaveck won six straight fights, but he's coming off of his fourth stoppage during that run -- a fifth-round knockout of Paul Delgado in February. The steel-chinned Zaveck suffered his lone defeat by split-decision to Poland's Rafael Jackiewicz in November of 2008, but has since avenged that loss with a majority decision in September of last year. Berto, meanwhile, endured a brutal battle against Ortiz (29-2-2, 22 KOs) during which both fighters were down twice. Berto was dropped in the first round as well as the final seven seconds of the sixth, and Ortiz was floored in the second round as well as early in the sixth. "After the Ortiz fight, Andre went to Indonesia alone for a while and really got his head together. I know that he's much more focused," said DiBella.